Ford представил новое поколение Focus ST, которое станет конкурентом для Volkswagen Golf GTI и Golf GTD благодаря 276-сильному бензиновому и 187-сильного дизельному двигателям. После бесконечной вереницы шпионских фотографий новый Ford Focus ST представлен официально. Причём модель со сменой поколений превратилась не только в конкурента Volkswagen Golf GTI, но и в соперника дизельному Volkswagen Golf GTD. Итак, речь идёт о машине с двумя двигателями. Под капотом Focus ST может быть установлен как 276-сильный бензиновый турбированный 2.3 EcoBoos, так и 187-сильный турбодизель 2.0 EcoBlue. Оба мотора стали самыми мощными в истории модели. EcoBoost получит технологию антилага, которая разработана была для суперкара GT и пикапа F-150 Raptor, позволяющую избежать ситуации с падением давления наддува в режимах Sport и Track. Оба мотора сочетаются с 6-ступенчатой механической коробкой передач, которую за доплату можно заменить на новую 7-ступенчатую автоматическую коробку передач. Впервые переднеприводный хэтчбек оснащён уже в базовой комплектации дифференциалом с ограниченным проскальзыванием с электронным управлением. Это в версии с бензиновым мотором. Дизельный хэтчбек вместо этого комплектуется функцией контроля тяги, которая подразумевает подтормаживание внутреннего в повороте колеса. В Европе новый Ford Focus ST появится в продаже летом 2019 года. Стоимость автомобиля пока не названа. 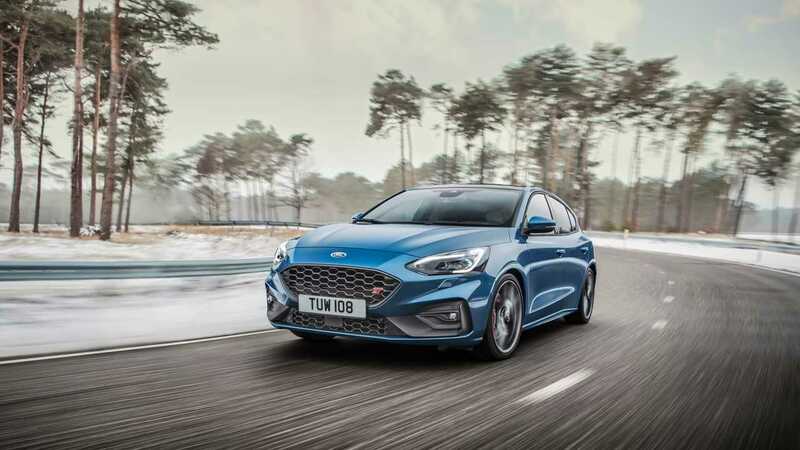 BRENTWOOD, Essex, Feb. 18, 2019 – Ford today revealed the all-new Focus ST – developed by Ford Performance to deliver nimble hot-hatchback thrills in a stylish, comfortable and practical family car. The all-new Focus ST builds on the class-leading driving dynamics of the fourth generation Focus in five-door hatch and estate body styles. Ford’s new C2 architecture is enhanced with unique suspension, braking and powertrain configurations for the most responsive and agile Focus ST driving experience ever – on road and track. A new engine line-up creates up to 12 per cent more power and 17 per cent more torque compared with the previous generation Focus ST. Ford’s 280PS 2.3-litre EcoBoost petrol engine and 190PS 2.0-litre EcoBlue diesel engine* both deliver a broad spread of power and torque across the rev-range. Ford’s first application of an electronic limited-slip differential (eLSD) for a front-wheel drive vehicle further enhances the cornering and stability of new Focus ST, sharpening responses to changing grip levels and driver inputs using computer-controlled pre-emptive actuation. A choice of six-speed manual or new, quick-shifting, seven-speed automatic transmissions is offered, and Selectable Drive Modes technology is introduced to the Focus ST for the first time, enabling drivers to adjust the vehicle’s character to suit the driving scenario. Continuously Controlled Damping (CCD) – standard for five-door EcoBoost variants – enhances the short long arm (SLA) independent rear suspension configuration for ultimate refinement. A new generation of Ford’s 2.3-litre EcoBoost all-aluminium engine is the most powerful ever offered for a Focus ST. Using advanced turbocharging technology to deliver 280PS power at 5,500rpm and 420Nm of torque from 3,000rpm to 4,000rpm, it is also the most free-revving Focus ST engine ever, and supports anticipated 0-62mph acceleration in less than six seconds. Engine response is enhanced using a low-inertia twin-scroll turbocharger, which scavenges exhaust gas energy more effectively using separated channels to minimise interference between gas pulses. An electronically actuated waste-gate allows closer control of boost pressures for optimised engine performance. In addition, a unique exhaust system that reduces back pressure, bespoke air intake system and optimised intercooler further improve breathing. Ford’s 190PS 2.0-litre EcoBlue engine is the most powerful diesel engine ever offered for a Ford Focus model, delivering peak power at 3,500rpm and 400Nm of torque between 2,000rpm and 3,000rpm – and 360Nm from 1,500rpm – for immediate and linear acceleration. The diesel variant features a low-inertia variable geometry turbocharger; steel pistons for less expansion when hot; and an integrated intake system with innovative mirror-image porting for optimised combustion help to deliver a diesel powertrain that produces 10 per cent more power and more than twice as much torque as the 2.0‑litre Duratec ST petrol engine in the first generation Focus ST170. The Focus ST’s six-speed manual transmission enables more urgent gear-changes and provides a sportier feel with a shift-throw reduction of seven per cent compared with the standard all-new Focus. Ford’s new rev-matching technology that debuted on the new Ford Mustang is also introduced as part of an optional Performance Pack for 2.3-litre EcoBoost manual models. Gear differentiation on the new seven-speed variant of Ford’s automatic transmission is optimised for performance, and Adaptive Shift Scheduling – which assesses individual driving styles to optimise gearshift timings – is enhanced to offer more flexibility and the ability to differentiate between road and track use. Drivers can select gears manually using steering wheel-mounted paddle-shifters. Developed to be as comfortable as it is fun-to-drive, the all-new Focus ST exploits the class-leading roominess and refinement of the standard Focus range, and features an upscale interior that balances everyday practicality and a sporty driving experience. Ford Performance engineers fine-tuned the positioning of Recaro front seats, while ESE technology amplifies engine and exhaust noise in Sport and Track modes – heightening the sports driving sensation and delivering additional feedback. Tuned engine mounts and an isolated subframe increase refinement for all occupants. Generous front shoulder room and best-in-class rear knee clearance combine with maximum 1,653-litre estate luggage capacity and a boot space that can comfortably accommodate a large dog crate, for maximum comfort and practicality. In addition to the sports steering wheel and Ebony coloured Recaro seats, the unique Focus ST interior intensifies the sporty atmosphere with an ST-embossed aluminium gear knob and scuff plates; alloy pedals; metallic hexagonal and satin silver decorative elements; and metal grey stitching for the seats, door inserts and centre console. The Focus ST builds on the premium, sporting Focus silhouette with subtle, functional styling changes and unique alloy wheel designs. Revised upper and lower front grille designs are optimised for increased cooling capability, and bold signature lower wing elements channel air in to the air-curtain inlets for improved aerodynamic performance. A larger, more steeply angled rear roof spoiler increases downforce to support the Focus ST’s driving dynamics. A twin exit tailpipe configuration borders the aggressively styled rear diffuser element, and improves practicality by delivering the towing capability that was prevented by the centre-exit tailpipes of the previous generation Focus ST. The Performance Pack also adds red brake callipers. Exterior colour options chosen to emphasise the Focus ST’s dynamic styling include exclusive Ford Performance Blue and Orange Fury, alongside Frozen White, Magnetic grey, Race Red, Ruby Red and Shadow Black. Bold alloy wheel options include 18-inch Dark Sparkle and Magnetite designs, with a 19-inch wheel also offered in Magnetite. 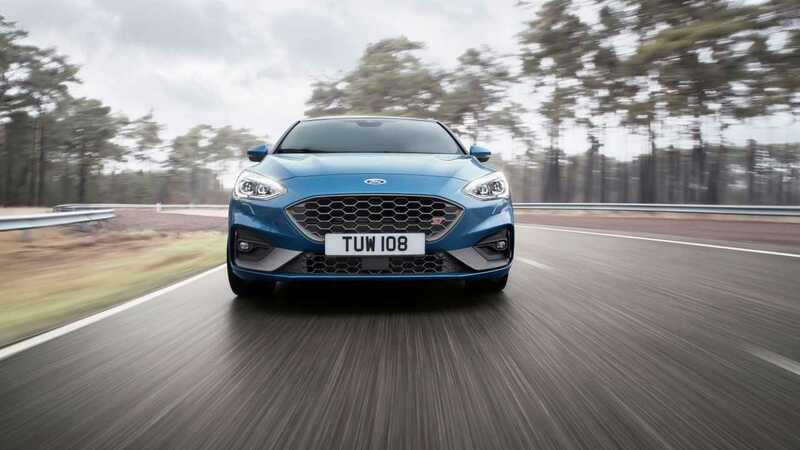 The Focus ST also benefits from the comprehensive range of sophisticated Ford driver assistance technologies that have helped the all-new Focus win 13 awards and a 5-star safety rating since going on sale in 2018. Ford’s SYNC 3 connectivity system allows drivers to control audio, navigation and climate functions plus connected smartphones using simple voice commands supported by an 8-inch colour touchscreen. The system provides Apple CarPlay and Android Auto™ compatibility free of charge, and available FordPass Connect embedded modem technology turns the vehicle into a mobile WiFi hotspot with connectivity for up to 10 devices. 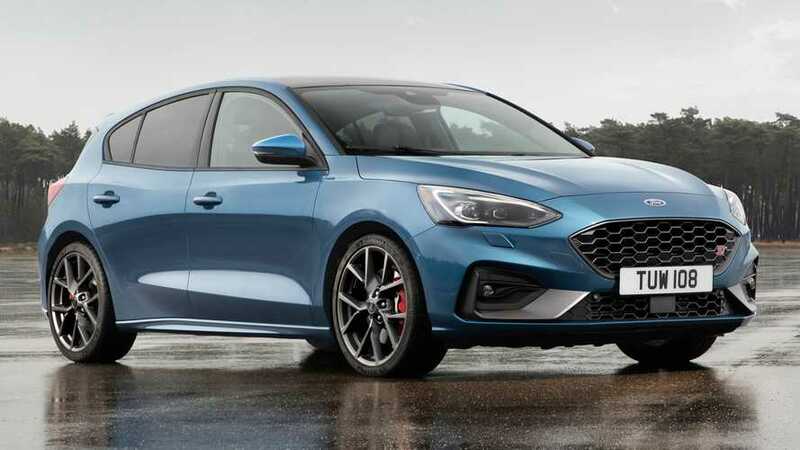 The all-new Focus ST will go on sale across Europe in summer 2019.